Be it a shampoo, a service or even a film star, branding is the surest way to get noticed in a cluttered market. Tamil cinema’s most enduring star, Rajinikanth, knew this at the outset. “Rajini’s motto was ‘differentiate and dominate’. 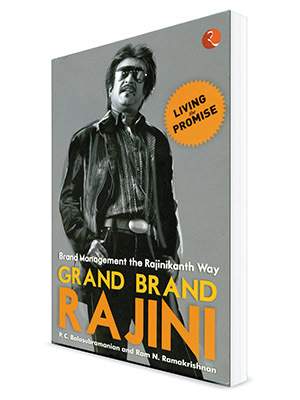 Establishing individuality was the nucleus of his work,” write PC Balasubramanian, founder of Matrix Business Services, and Ram N Ramkrishnan, a management consultant, in their book Grand Brand Rajini. It traces the journey of a “lungi-clad, beedi-smoking villain” to a “sophisticated digital robot”; the evolution of a mere product to a timeless brand that “provides credibility, connects with customers emotionally, motivates a buyer and creates user loyalty”. Throughout his four-decade-long career, Rajini has developed unique brand attributes that have enabled him to be distinct from other luminaries of Tamil cinema, such as MGR, Sivaji Ganesan and Kamal Haasan. The writers argue that “the Rajini brand became saleable through imagination”. He was neither the archetypal hero nor the regular villain but his version of histrionics captured the market. His twist of glasses, chucking of the cigarette to the lips, and crackling punch lines ensured instant brand recall. They were as powerful as Nike’s ‘Just Do It’ or Intel’s signature jingle, the writers say. Recently, I had published this post: 6 Super-Awesome Lessons Superstar Rajinikanth Can Teach Businesses About Branding. Interested readers can check out the link below: https://www.linkedin.com/pulse/6-super-awesome-lessons-superstar-rajinikanth-can-teach-sadasivam I would be happy to know your comments. Its not correct to say that fans go to watch him and not his movies. The superstar teams up with the best directors and music directors to ensure his fans have a good time. It is however that he must be there in each and every frame. His co-stars must stand with their hands folded or face the anger of his fans. After all he is the Yesaman!